This blown glass ornament featuring an amusing penguin happily dreaming of wintry weather provides a wonderful way to celebrate your family this holiday season. 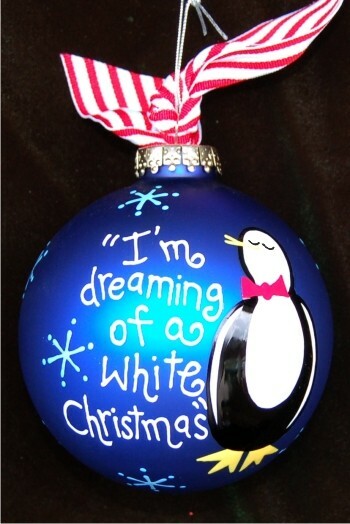 The dreaming of a white Christmas - our family glass Christmas ornament has room enough to add the names of eight family members to its globe. One of our family & relatives ornaments, this one is an opportunity to honor the elders in your family or celebrate the addition of new members in the past year. Get a dreaming of a white Christmas family glass ornament this year for everyone in the family and they'll be cherished for generations. A gift for family members. Nov 13, 2017 Celeste M.
Received as gift Nov 1, 2014 Betsy M.